Recovery is an essential part of exercising, to increase muscle size or power there must be breakdown in muscle fibres to result in regeneration and development. Without adequate recovery, muscle development will be inadequate or not occur at all. Recovery combines many facets including rest, rehydration and refueling. The refueling gold standard combines a mix of protein and carbohydrate and is consumed within 30 minutes of ceasing exercise. 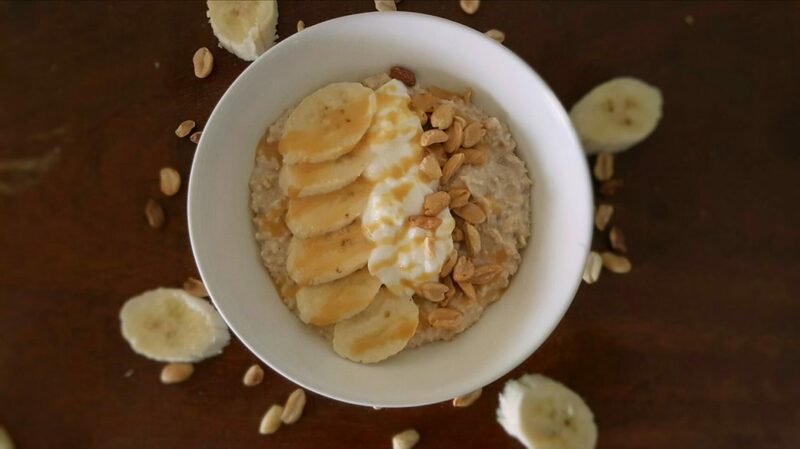 Overnight oats combines both carbohydrates (oats) and protein (milk) and is a great option to have ready in the fridge for a recovery meal at any time of day. I have posted a number of previous flavours but this recipe came about with the presence of a bunch of very overripe bananas. My other favourites are: Spring Bircher Muesli, Apple & Cinnamon Bircher Muesli . Quinoa is another great option as it’s bursting with protein Stewed Apple & Poached Plum Quinoa Porridge. Or when you are really short on time, my Berry & Oat Recharger is the one for you. Place all the dry ingredients in a bowl or jar. Mix all the ingredients together with the nut butter and milk until well combined. Store overnight or for at least 5 hours in the fridge. Serve with some chopped banana, nuts/berries, a drizzle of nut butter and a dollop of Greek yoghurt. Newer Previous post: Who Doesn’t Love Pancakes! !